Medications used to combat high blood pressure appear to be linked to a lower incidence of Alzheimer's disease, according to a study published on Monday. Whether there is a true cause and effect relationship needs further study, said the report ... While all hypertension medications in the study seem to have an impact, the greatest reduction in the risk of Alzheimer's disease was found in those taking diuretics, which cause the kidneys to excrete water and salt but spare the elimination of potassium. Unpublished findings from another study "suggest that increased potassium levels may be associated with a reduced risk of dementia," said the study, while other researchers have found that low potassium concentrations are associated with changes in the brain that may lead to Alzheimer's disease. While high blood pressure is thought to raise the risk of Alzheimer's, "the protective effects of these antihypertensive medications may be independent of their ability to control blood pressure," the study said. Speaking of cutting meat to death, I don't know if I ever mentioned this before. A year ago, maybe more, I noticed that when we were all at my grandmother's on Sunday nights for dinner, everyone got a paper or styrofoam plate to eat off of...except my dad. Even if we were having "sandwiches" (meaning a plate of cold cuts and hard rolls) my dad would have a real, hard, breakable plate which had to be washed. Seems like it should be the opposite right? My mom and grandmother told me when I wondered aloud, half joking, "Why does Daddy get a good plate?" 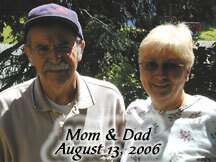 that he had been cutting THROUGH his paper plate and into my grandmother's table with his obessessive cutting. And whenever we had something with sauce or gravy ("juice" as in," give me some of that juice") he put so much on his plate it would soak through and stain the table. Not sure what he was doing with sandwiches that made him deserve a real plate. And of course, he's as oblivious to the fact that he's got a special plate as he was to the fact that he was cutting through his paper plate. Not to mention the farting which he claims not to be doing. Although he doesn't seem to fart as bad at my grandmother's. Or maybe I don't notice it because my grandmother's sitting next to me belching away, not making any attempt to swallow or stifle the burps or even cover her mouth or pause her conversation. Not last Sunday, but the Sunday before, we started a new puzzle at Grandma's. It was actually a cool puzzle. It was a vat of Cracker Jacks and half-buried in the vat were boxes of Cracker Jack. We made progress on putting together part of the outside and starting to sort the pieces. I told my grandmother I'd come over the next day and help her with it. That was the day I ran into my friend from high school who's got cancer. I believe I talked about it in my old shaman blog. (I have a new shaman blog now.) So I was shaken and upset when I got to my grandma's--to find that she had taken apart the Cracker Jack puzzle and started a new one. I did the outside of that one for her and also the sky before I went home, took the cracker jack puzzle upstairs and started sorting the pieces on the bed. 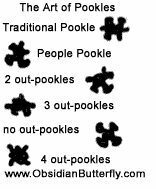 My Aunt Bert (who died of Alzheimer's a couple of years ago) also did puzzles and what I learned from her is that the bumps and holes in puzzle pieces are called "pookles". My mom also picked that word up from Aunt Bert, so we'll say, "Do you have a piece with three out-pookles?" My grandmother can't pronounce the word or understand the concept. What my mom and I like to do after we've done all the parts of the puzzle that are easy to do by color, is to sort the pieces by shape. Four out pookles, four in pookles, traditional pookle (2 in, 2 out, on opposite sides), people pookle (1 out, 3 in, looks like a person) and corner pookle (3 out pookles on the corner with one in) .